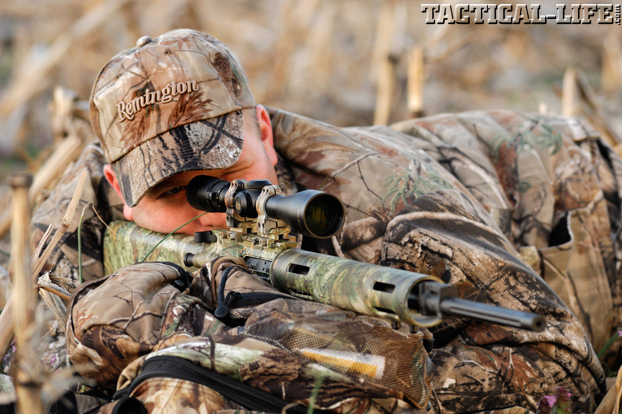 Before setting out for a trophy, learn how to avoid common rifle blunders with these five AR hunting strategies. 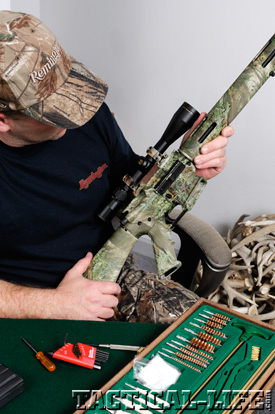 Five AR hunting strategies to learn how to avoid these common AR rifle blunders. Many of us grew up shooting and hunting with a bolt-action or maybe a standard-stocked semi-auto. Now, there is a wave of enthusiasm for using the AR platform for hunting game. Go for it! An AR-15 or AR-10 is a blast to shoot. They have low recoil and are more accurate than you might expect on the range and in the field. But an ArmaLite, Remington R-25 or any other AR hunting model looks, feels and handles quite a bit differently than the traditional bolts and semi-autos you have used for years. But that’s not a big deal. 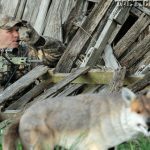 With these five AR hunting strategies, you’ll be mowing down targets on the range and critters in the field in no time. I thought, “Whoa, it’s sure different than my Model 700.” Indeed it was. All AR rifles are. I spent an hour with the R-25, reading the owner’s manual, and getting familiar with the firearm. As compared to a bolt rifle, a short, boxy, pistol-gripped AR has a completely different feel. And it is a more complex firearm, with more moving parts. Get to know your AR before you shoot it, much less go hunting with it. I turned the unloaded R-25 over and over in my hands. I shouldered and un-shouldered it many times, until the large, round forend tube and the pistol grip felt comfortable. I worked the rear-sliding bolt over and over. I practiced seating and removing the unloaded magazine. The side safety on an AR sits low on the receiver and has a much different feel than the triggerguard or tang safety that you are probably used to, but with time and practice, it’s easy to engage/disengage. All told, it takes an hour or so to get a good, initial grip on an AR-platform rifle. 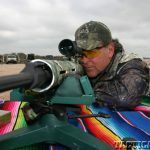 The day before my Texas deer hunt with the R-25 began I hit the range, sat at the bench and loaded four 150-grain Core-Lokt Ultra-Bonded cartridges into the four-shot magazine. I clicked it into the rifle, chambered a round and settled on a target bull. I fired the first shot—it was dead on at 100 yards! The next two bullets printed within an inch. The first time I fired this particular rife I produced three tight shots. Not bad! I proceeded to ravage Eddie Stevenson’s ammo stash and shot up most of the rounds he had brought. Shooting an AR is addictive! I was impressed with how the R-25 produced virtually no recoil, and easily settled back into the bags and on target after every shot. The semi-auto gas action eliminated most of the muzzle flip. I was getting used to the feel and position of the pistol grip, side safety and fat forend. The single-stage trigger had a bit of creep, but not very much. It’s all part of the process. Like I said before, the first thing to do is get familiar with your new AR at home and on the range before you think of hunting with it. This obviously makes a lot of noise that will travel especially far on a cold, still morning. Factor that into your hunting routine. 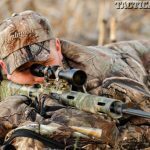 Before heading out to call coyotes or stalk a deer, load up at your truck, make sure the rifle’s safety is engaged and handle your AR safely as you sneak forth. On the ground, an AR carbine is easy to handle and shoot, especially from the kneeling or sitting position. But you’ll shoot better with a tree or fence post for a rest, or with the use of shooting sticks. An AR has an oversize forend, and you’ll need thick, stout shooting sticks to rest it solidly. Thin, flimsy sticks that work well with a bolt rifle won’t cut it with a hefty, modular-repeating rifle. Some ARs come equipped with small bipods, and they are easy to add to most rifles. 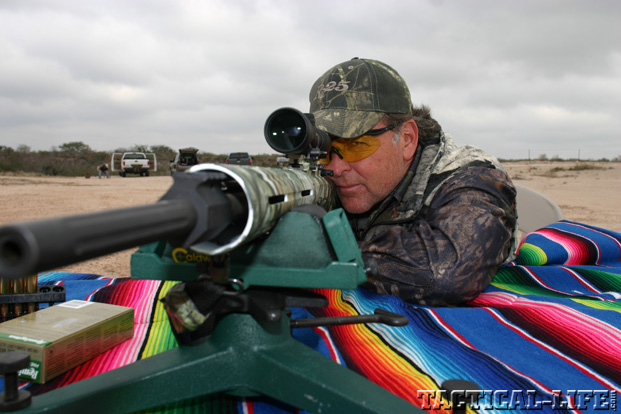 These work great in big, open country, where you can go prone for shots at deer or antelope. But stout sticks work best for sitting shots and especially when you’re calling predators, when you need to be able to see and shoot into sage or grass. 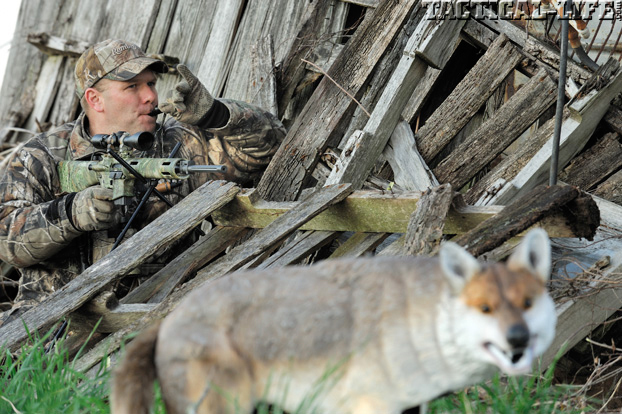 Then sneak toward your stand from downwind and hunt your way in. 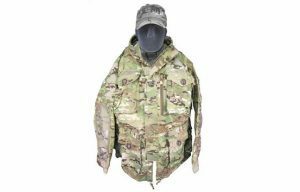 Many a buck has been taken by the good hunter who moves slowly, looks, spots a rack, kneels and kills a deer halfway to his stand. Of course, most days it won’t happen like that, and so you have a dilemma. You must remove the magazine and unload the AR’s chamber before roping the gun up to your stand (barrel down). Then what? 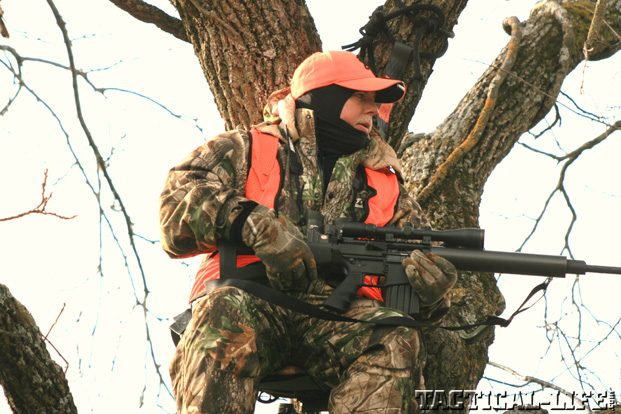 Once you’re up in the stand, if you lock and load and clang-bang, every deer within a half-mile will hear it. You have this problem in the morning, too. There is no reason to load any rifle for the hike in the dark. For safety, never do that. 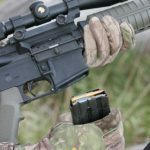 After roping your unloaded AR up into the dark stand, now what? Here’s what. 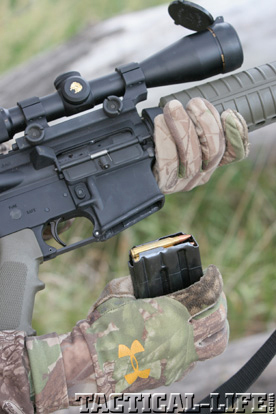 Once you’re up and harnessed into your stand, pull up your AR and pop in a full mag. “To quietly close the bolt, utilize the charging handle to keep the bolt from slamming home and making noise,” says Fink. “While holding the charging handle fully to the rear, hit the bolt release and ease the bolt forward. You may have to pull back on the charging handle and release slowly to get a round to feed from the magazine. 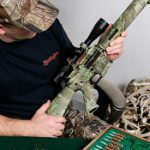 Once the round is chambered, use the forward assist to ensure complete lock-up.” This is one of those unique and complex AR things that you need to practice many times at the range before you try it 17 feet up in a deer stand. 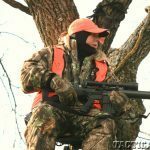 Most people equate an AR rifle with stalking and ground shots, but a short, easy-to-handle carbine is great for popping deer from a treestand. Here’s a tip: Set your stand so that it points at a 45-degree angle to the right of where you expect to see deer out front (assuming you are a right-handed shooter). Now you can easily see and cover a buck that comes in anywhere in the 180-degree arc in front of your stand with virtually no movement. When you see that 10-pointer, scrunch low on the seat, lock the AR to your shoulder, bore your elbows into on your thighs or rest them over your knees, flip off the side safety and take him. Whether he’s your first AR buck or your 10th, it’s sure to be a rush.